Biography of 19th Century French History Painter. In his day one of the most famous painters in France, he studied at the Fine Arts Academy in Paris before becoming one of the leading pupils of Baron Antoine-Jean Gros (1771-1835). He concentrated mostly on history painting, choosing subjects based on stories of English Kings and Queens. These melodramatic compositions - which achieved huge sales in the form of engravings - brought him European-wide fame and made him the doyen of the French Academy, which itself was notorious for its conservative aesthetics, its love of history painting and its preference for classical realism. Three of his best known masterpieces of French painting were: The Princes in the Tower (1831, Louvre, Paris - replica in Wallace Collection, London); Oliver Cromwell Gazing at the Body of King Charles I (1831, Museum of Fine Arts, Nimes); and the Execution of Lady Jane Grey (1833, National Gallery, London). He was born Hippolyte Delaroche into a wealthy Parisian family. At his father's insistence he first learned landscape painting at the French Academy under Louis Etienne Watelet. Alas, landscape was a genre for which he had little aptitude, so in 1818 he switched to figure painting, becoming a pupil of Baron Antoine-Jean Gros (17711835), the distinguished French history painter and chronicler of the Napoleonic era. In 1822 he exhibited for the first time at the Paris Salon: his entry being Josabeth saving Joas (1822). It was here that he met and befriended Theodore Gericault (1791-1824) - who had just produced his famous masterpiece Raft of the Medusa (1819, Louvre, Paris) - and Eugene Delacroix (1798-63) - one of France's great romantic painters who would soon produce extraordinary works like Death of Sardanapalus (1827) and Liberty Leading the People (1830, Louvre, Paris). The trio formed the core of a larger group of French history painters. During the 1820s Delaroche set up a studio in the Rue Mazarine where he developed his naturalist style of historical art. His subjects included well known scenes from the lives of famous historical figures including numerous members of English royalty, Thomas Wentworth, 1st Earl of Strafford, Joan of Arc, Cardinal Richelieu, Marie Antoinette, Peter the Great, Napoleon, and others. Like the 20th century political films of director Oliver Stone, Delaroche's scenes were dramatizations rather than historical reconstructions - and the public loved them. Within a decade he was acclaimed as one of the best history painters in France, receiving wider recognition than even Delacroix and Ingres (17801867). Students in his thriving, highly-regarded workshop included the English history painter Edward Armitage (18171896), the English landscape artist Henry Mark Anthony (18171886), and the American artist Alfred L. Boisseau (18231901). At the 1834 Salon, he showed one of his great works of Romanticism, The Execution of Lady Jane Grey (1833), to great acclaim, but in 1837 his exhibits received negative reviews from the critics, as a result of which he never again returned to the Salon. He toured Italy in 1838 and 1843: visits that coincided with the tenure of his father-in-law, the military artist Horace Vernet (1789-1863), as director of the French Academy in Rome. Sadly, his marriage to Vernet's daughter Louise, in 1835, lasted only until her premature demise ten years later. Delaroche is said to have never recovered from the shock of her death. For a comparison with another French history painter of a similar polished academic style, see: Ernest Meissonier (1815-91). During the 1830s Delaroche went into engraving, producing a series of prints of his historical paintings. These intense and emotional paintings may have been executed in the best Hollywood style, but are nonetheless marked by a mastery of draughtsmanship and fondness for meticulous detail, resulting in a true-life realism that verges on the photographic. In any event, it wasn't long before engravings of them hung in thousands of homes in both France and England. He also produced a quantity of religious art - including a series of small pictures of incidents from the Passion of Christ, in memory of his own wife Louise - and a number of portrait paintings. In addition, he became an outstanding teacher at the French Academie des Beaux-Arts, where his pupils included the portraitist and history painter Thomas Couture (1815-79), the great plein-air naturalist Jean-Francois Millet (1814-75), and the academic history painter Jean-Leon Gerome (1824-1904). Conventional, even Royalist in his outlook, Delaroche remained a loyal servant of the Academy to the end of his life. In 1837, he won the commission for The Hemicycle (1837-41), a huge painting in the hemicycle of the award theatre of the Ecole des Beaux Arts in Paris, depicting seventy-five of the most eminent figures in philosophy, painting, sculpture and architecture. Although completed in 1841, it was seriously damaged by fire in 1855. Delaroche began the restoration immediately but died in November 1856, before making much progress. The work was finished by Joseph-Nicolas Robert-Fleury. Delaroche's style of academic art had a significant influence on a number of contemporaries, including the French-born English artist Ford Madox Brown (1821-93), and other members of the Pre-Raphaelite Brotherhood. Although the subject-matter and style of his painting fell out of fashion after his death - in a review of a retrospective exhibition of Delaroche's work (1857) the critic Theophile Gautier attacked the derivative, literary character of the paintings - they are once again being taken seriously. Pictures by Paul Delaroche hang in several of the best art museums in France and across Europe. - Joan of Arc Being Interrogated (1824) Fine Arts Museum, Rouen. - The Death of Queen Elizabeth I of England (1828) Louvre, Paris. - The Princes in the Tower (1831) Louvre, Paris. - Cromwell Gazing at the Body of Charles I (1831) Fine Arts Museum, Nimes. - The Children of Edward (1831) Louvre, Paris. 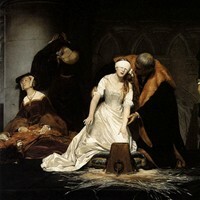 - The Execution of Lady Jane Grey (1833) National Gallery, London. - Strafford led to Execution (1836) The Royal Collection, London. - Charles I Insulted by Cromwell's Soldiers (1836) Private Collection. - Herodias (1843) Wallraf-Richartz-Museum, Cologne. - Napoleon Abdicating in Fontainebleau (1845) The Royal Collection, London. - Bonaparte Crossing the Alps (1848) Louvre, Paris.  For biographies of other 19th century French artists, see: Famous Painters.  For more details of history painting and other genres, see: Homepage.